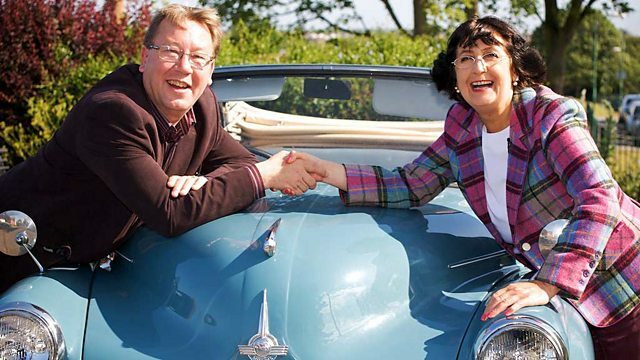 Charlie Ross and Margie Cooper begin in the Scottish capital at Edinburgh, then travel through Dunfermline and head to Stirlingshire for an auction at Kinbuck. With £200 each. A classic car. And a goal, to scour Britain for antiques. Charlie Ross, Margie Cooper, and a 1961 Sunbeam Rapier. -My uncle had a Sunbeam Rapier. -and a bottle of pop? -Yeah, I'd be feeling car sick! is a bit of a classic car specialist. He's also a Road Trip regular. With a reputation for decisive action. Seen it, loved it, bought it. prefers a rather more roundabout approach. I don't particularly like it. Not so much "vene, vidi, vici". More, "she came, she saw, she dithered". he's amassed a total of £271.28 to spend today. with £315.10 in her pocket. Not that they seem to be taking it at all too seriously. Woke up the other night, made a cup of tea in my pyjamas. to reach journey's end at Hamilton, South Lanarkshire. and head north to Stirlingshire for an auction at Kinbuck. Oh, my hat's gone! Oh, my hat's gone! Oh, stop! Edinburgh's made those two even giddier, it seems. The city is built on seven hills, a bit like Rome. why it's considered one of the best places to live and visit in the UK. It has some of the quirkiest antique shops too. -Antiques and Curios. Look, it's all outside as well. Wonderful. Do you think the car's for sale? -I'm off to spend me cash. -Good luck, mate. See you later. Hm. Sounds like he's already spotted something. That's nice for the price. Straight out of the blocks. When did you last see the back of your shop? Oh, must be two or three years, I think. A chap could spend weeks in here, and only graze the surface. Can I have a clamber? -It is, I think, Alan, what you'd call an eclectic mix, isn't it? Careful, now, we don't want a landslide. -Has that got a carriage clock in it? Came in yesterday, eh? Catnip to collectors. How lovely to see it in its original box, with the original key. its little door. And it's got a serpentine-shaped brass case. No doubt, an English case with a French movement, I imagine. -And about 1,900 in date. Carriage clocks were a French invention in the early 19th century. Also known as officers' clocks. and the carrying case was a key component. How much is said item? -Well, I would think about £100 I'd expect to get for that. Yeah, I thought you might say that. -The best thing about this is the original case. -A bit tatty but someone will love to restore it. I think, if that didn't have its original box, that's a 50-quider. But I think that does help considerably. and give that a bit of thought? Have you got any silver on board? -Funny you should ask, Charlie. -Well, I have a few bits tucked away here. This is a veritable Aladdin's cave here. Now, these are Edinburgh spoons. They're quite nice. I just was looking at the back and seeing that they're Georgian. They've got the thistle and the castle. -And there's six of them. -That's a silver pocket watch. HE BLOWS There we go. London maker. That's turn-of-the-century, isn't it? -I'm getting very excited here. -What else has Alan got in there? That's got quite a nice Art Nouveau top. Gosh, what a lovely top to that. A bit dented, but silver. Hob-nailed cup body to it. In good order, really. -How much is your jar? -Well, it's in pretty poor condition. -It's not in great condition. £15? You know what? I'm really tempted by it. But I don't know how much leeway there might be on the clock. I don't suppose you'd sell it to me for 60 quid, can you? -I think I would, 70, I would. -Would you sell at 70? and I'll shake you by the hand, sir. That's very kind, sir. I have to say, I can't stop now, you see, because I get the buying bug. I don't suppose it could be a tenner, rather than 15? -Let's put that in at a tenner, yeah. -This is getting better by the minute! -I think I'm going to have one look at your lamp, if I may. Not forgotten it then, Charlie? Again, rather like this carriage clock. A lot of these have been reproduced over the years. feel the weight, to know that that is a 19th-century lamp. And it's got its original Starboard label on it. and literally means, the side on which this ship is steered. to the right side of a vessel. And mooring at port was on the left. Hence, "port". It's a mean offer, it's a rude offer, and I'm not expecting anything. I think it might make 20 quid at auction, 15, 20 quid at auction. -Let's move it on, yes. -Yes, let's get rid of that. Fair point, Alan, the shop could get crowded otherwise! -Very good day. And thank you so much. to visit a museum entirely dedicated to money. of the Bank Of Scotland. Founded in 1695, it's the second oldest surviving bank in the UK. and can take many different forms. Pretty much anything can be money, if you think about it. It's just that some things made better money than others. It's got to be something that's desirable. which were being used in parts of China, at least 4,000 years ago. -Couldn't you just go along the beach and get those? One afternoon, you'd have a lot of money in your pocket. from where they were actually found. In China, they were used inland. Where do these beads come from? These ones here come from Solomon Islands. You can notice there are four different coloured beads here. based on how easy or hard it is to find that particular shell. So, the white shells and black shells are quite easy to find. Then you have the pale orange beads. Finally, the reddish orange beads. find the shell, and get up to the surface again. -So, he become a rich man if he could do that. -Probably, the person who made the beads then became rich. Money, it seems, really does make the world go round. were as important as cash north of the border. This is a beaver pelt. to get their supplies, priced everything in beaver pelts. Just as we go into a supermarket today. one beaver pelt would have got you four knives, or two pounds of sugar. because, back in 1696, the Scots invented the modern banknote. but not in set denominations. You know, you could get a banknote for whatever amount. -And it's still the same today? -It's still the same today. -Oh, it's amazing, isn't it? since the Bank of Scotland started issuing them. But the bank has been fighting back for almost as long. -That's amazing that it's survived. -because it was evidence in a forgery case. This wavy line here is actually deliberate. It was an early anti-forgery device. a bit like a cheque-book. the teller would just cut a random wavy line. and if they didn't match up, he knew you presented a counterfeit note. they have a suitable jaw-dropping selection of the latest banknotes. Never mind about beads, now you're talking! -A million pounds in £20 notes. Number one there. I could get that in the back of our car. because of that cancelled notice on every single one. Never mind. and motor to another of the city's destination antiques emporia. What are you doing taking me down a dark alley? -Have you got designs on me? -I'm trying to find you some antiques. I can't believe there's an antique shop here. Go around the corner, you'll see. Come on, Charlie. Shall I go first? -I might buy one of those. -No, you can't have a basket. with the accent on vintage. Oh, look at his little ears. Including costumes, toys, militaria, and much else besides. Margie's downstairs with proprietor, Lewis, being sensible. -You've got a set of six, not very old. I mean, they're heavy, they're so heavy. Edinburgh crystal? -Not much age to that. You really need to see them all, don't you? any one of which could be included in the deal. So, could you sort of do me a parcel with the glasses cheap-ish? it's the cheap bit I'm having a problem with. Something tells me this could go on a bit. It's a folding bagatelle table. And you whack your ball. If you get it in this hole, you see, you get one. And the more difficult they are, the more points you get. You have your little balls. Ah. is a French invention which is part billiards and part bowling. You can also see how pinball and even crazy golf developed from here. -Not as easy as you think, this. but I'm not sure he's convinced it's worth buying. -Now, how are things in the slow lane? -It is. And it's small. it has a French movement. -They're not easy, are they? -Have you got the keys? -65 and I'll buy it. -I am sure that's what I paid for it. I can't believe I'm even interested in a slate clock. But it's so pretty. That is so sweet. It's got these little Corinthian columns. 68? Our Margie can be a very trying customer. Meanwhile, Charlie, for once, is equally at a loss. I need some assistance, please. I need an injection of definitive decision-making. You've only been with Margie a short while. I do hope indecision isn't contagious. It's a lonely old life, really. It's a lonely old life when you can't make up your mind. that there's a lot of antiques shops here. There's another shop there. What a lovely looking shop. I'm going to have a look in Bodkin and Farrish. You never know. There might be the object of my dreams in there. -May I look around your shop? -Pleased to meet you. Hugo. Yes. But Bodkin or Farrish? Anyway, I think Charlie will perk up in here. Look at that cabinet there. Look at that cabinet. French, do you think? It doesn't look English to me. I adore the carving on the doors. Exquisite. 1880. £260. Love to buy that for 100. I wonder how flexible Hugo is. Hugo! May I borrow you? -I was just looking at your cabinet there. The bottom door is sensational. The carving is fabulous. -I mean, I think that would make at auction about 140 quid. -I know what you're saying. I don't suppose it's buyable for 100 quid, is it? -If it were, I would buy it. -I think, sadly, it's cost me more. -I've had to restore that. I think I paid 140. But because of my quiet Sunday, I'll take 150. I feel good vibes with Hugo here. But, you know, do I want to gamble? You know you probably do, Charlie. But there may be something else. How about one of Hugo's fine sideboards? Something that took my eye over here was a frame. It's not silver is it? No, that's a plated frame. -Not a repro, is it? Look at that, Romeo and Juliet. Romeo, Romeo, wherefore art thou? I'm here. "Parting is such sweet sorrow." To me, it doesn't matter a tuppenny job that it's not silver, really. I quite like the base metal coming through here. Adds a depth to the colour. Look at him. That all ended rather badly, didn't it, Romeo and Juliet? Well, at least the auction's not in Verona, eh? -How much is "Parting with sweet sorrow?" -And that'll be a roaring profit on that, I'm convinced. You wouldn't like to take £40 for that, would you, Hugo? -That is what I was about to say. -I would like to pay £40 for that. -still hankering after that cabinet as well. you don't want to take £100 for your cabinet, do you? -Give me the 140 I paid for it. -No, no. I'm not going to. It must be the sun. And the busyness. And I'll take your £100. You should be quicker than that, sir. -Oh, my goodness me. I've just bought another thing for £100. I'm more excited to see how much profit you make. That's a very sporting attitude, Hugo. -still hasn't bought a thing. So far, Margie's agonised over some glasses, and a slate clock. I wonder where the balls are. Are these the balls? These are the balls. And you can have a jolly, jolly time playing. I don't quite know how it works. Nice thing though. Edwardian. Yes, we've heard all that from Charlie. than her travelling companion was. -Can that be 60 quid? I don't blame you but I just want the guarantee really, don't I? -You did beat me down with the clock. It was actually 75 but... I'm losing the will. I'll buy something, don't worry. I'm getting really close now. Well, fingers crossed. Back to the clock, eh? -So the clock and the game. -We're nearly there, aren't we? -You're there. I'm not there yet and you are. 68 each. 136. I think Lewis might need to sit down for a bit after that. £138 on two lots for Margie and all in all it's been quite a day. No wonder they're feeling a trifle dizzy. Next morning, Charlie accuses Margie of hanging onto her profits. -You're not going to spend that 315 quid, are you? SCOTTISH ACCENT: I think I'll spend six poonds on this one. And seven poonds 50 on that one. And I'll keep the rest in my handbag. I don't want to risk it. a dressing table jar, a cabinet and a carriage clock, as you do. Leaving him with just over £40 in his wallet. I knew you were going to be trouble the minute you came in. ..meaning she has £177.10 to spend today. down on the historic dockside by the Firth of Forth at Leith. -Look at this. It's enormous. Bye, darling, have a lovely time. Spend all that super cash. I wish I'd got more. Looks a serious place. -Margie. Pleased to meet you. Thanks for letting us come to this amazing place. -So how long have you been here? We're in this warehouse 25 years. has recently won an accolade as one of the finest shops in the UK. Sure to suit our Margie. Poor old Charlie, he'd have loved it in here. That's right. But I'm sure she won't rub it in. Not. This is a pull-out table from about 1820. This is a Gillows one. -Oh, my word. These stamps are so important. but I'm sure John can guide the way to the more affordable items. -Here's something interesting for you. -Ah, a box. A tin box. The ticket price is £75. -That's quite smart. Buy that. -There's wages left in that. -Wages left in that. I do like that. -I haven't said yes yet. I can tell by the way you replied. You can see how he's successful, can't you? Something tells me our John isn't a man to dither with. It's going to be £50 to you. Would it sell for you? -You can have that for £30. Actually, £40 and I'll throw in another piece. -How much would those be? 35? -£40 for both. That's a fair price. No deal as yet though but this is shaping up well. she spends a fair part of it, quickly too. This is an interesting piece. It's for dealing cards. Four decks of cards. It could be blackjack, something like that. It deals them out singly. It's got all the information. -That's good. That's really good. The ticket price is £25. -You can have that for £20. Do you really like it? -£20. A deal. Shall we shake hands on that? Fast work. Now let's get back to that Carlton Ware. So how much have I spent? but do we have a deal on that as well? Could it just ease a bit and I'll buy it? -How much did I quote you? -No. No 38. It's £40. It's Monday morning, it's 9:30, I have a long week ahead of me. -Will you please leave now? -Five of those are yours. With £95 spent, Margie's shopping is finally complete. Well, he's finally headed out of the capital. Look at this. I couldn't be in a more perfect place. dedicated to the humble bus. -It's Eddie. How do you do? I never thought I'd come into the middle of Scotland and find so many buses. -How many buses have you got? -Are they all owned by you? If I have a bus and I want to put it in here, I pay you a rent, do I? is the largest of its kind in the world. it owes its existence to enthusiasts and their valuable spare time. What a wonderful view from up here. sitting here in the middle of winter? A Scottish winter? Basically everyone here just loves buses. This is one of the oldest buses we have on the site. It's one of the first generation Glasgow double-deckers. During the Second World War it was actually converted into an ambulance. and then it was discovered as a caravan in a field in Kent. -Have you got anybody here who used to drive buses? -Ten years I was driving in Edinburgh. applied to horse-drawn carriages before engine-powered vehicles. The word "clippy", however, is uniquely British. with the conductor or conductress, commonly known as a clippy. -Because they clipped the tickets? -Clipped the tickets, exactly that. -I've got an old ticket machine. So there you go. -Absolutely. All you have to do is turn the handle. That will be thrupence, please, sir. but it's all about to get even better. -So am I going to be entrusted with this big beast? You're going to be driving this huge monster, yes. Of course the driver needs to be appropriately dressed. So you must have the appropriate uniform. -Oh, I look forward to wearing it. Careful, Charlie. Easy does it. We'll get you as a bus driver yet. Easy. I feel strangely at home. And there you are, you're a fully fledged bus driver. -Thank you very much indeed. I loved it. Ah, Cupar. That reminds me. It's now time to take a look at what they've bought. -I have a double reveal for you. -And one there. Izzy-whizzy, let's get busy. Go round the front and have a butcher's. Now then, that's not English. No, it isn't. What is it? What I quite liked about it... Look. It's quite a nice thing, isn't it? That's a lovely little thing. -I think you've cracked it there. Good start, Charlie. She's impressed. -Starboard. That cost a tenner. -Ah! You've come to my territory. -Just for you I've got some silver. -Do you want to pick it up and look at it? How old is it? -What's it worth? What would it make at auction? -I think that's going to make between 40 and 60. -Oh, a little carriage clock. The only reason I bought that is because it's in its original case. -Its original key and it's a serpentine front. -Right, here we go. Ready? I know where you bought it! -Hang on! Your clock's chiming. The balls are the key there because they're an odd size and you can't get them. -I love this. Is this a biscuit tin? -Is it a McVitie & Price? The key to this is the condition, isn't it? Look at the paintwork on it. Now, safe bet or gamble? -Now that's something, that's French. It's a card shoe for dealing cards, for blackjack. -Oh, my goodness! From a casino? -Look how nicely made it is. I don't think I've ever seen one of those. Decks of cards in there and the croupier brings them out like that. -I think that's probably your best buy. -Am I allowed to be rude about one of your purchases? -I've been nice about your things. -Do you know why I think it's ghastly? -Because I once bought some. -And got stuck with it? Right, let's go. Off into the sunshine. Now what did they really think? That bit of silver! He's definitely going to make £40 profit, definitely, on that. It's gorgeous. Art Nouveau silver. Lovely. The Carlton Ware is ghastly. Yesterday's antiques, Margie. Frankly, if they make 15, you'll be a lucky girl. I think he's done really well and I think he's going to get me on the second auction. I think I've got the edge. I'm rather thinking after this time I'll have my nose in front. at the hamlet of Kinbuck. -I do not. And if it rains on my head we are pulling in. -Do you want to tie it round your head? No, it wouldn't be you, darling. -This is when you begin to wish you had bought some galvanised buckets. Is that yours over there, the yellow ladders? -I hope they've got our things. -It's a real cat, there's a real cat there. Hasn't got a lot number on it, has it? so they should be well placed to handle what Charlie and Margie have come up with. Let's hear what auctioneer Kate Robertson makes of it all. Carlton Ware, very run-of-the-mill, mediocre. We get them all the time. I don't expect it to make any more than £15. and very heavy to move around. That slate clock's the right size and it's nice and neat and clean. The one that I think will do the best is the carriage clock. These clocks normally make £120-£150. and he spent £230 of it on five auction lots. So Kate's got her gavel and she's ready to go. First we have Charlie's starboard lamp. That will see some excitement. Let's go. Are you ready? So, Charlie? £20. 20. Thank you, sir. £20 bid. Come on. This is a nice one. £20. Advance on 20. Come on. The ship's lantern. 22 down and 24. 26. 28. £28. Wee bit more. 28. 30. 32. £32. Advance on 32 now. We're finished on 32. All in for £32. -There is a happy bunny. Lamp profit, profit lamp. Ha-ha! Ladies and gentlemen, place your bids for Margie's card shoe. -Looks good in a casino. -Do you? Rien ne va plus. -Ah, rien ne va plus. -God, I've set him off. -FRENCH ACCENT: I don't mind if I do. This is quite a smart piece now. A dealing shoe. -We don't have many of those in here. 40 on the dealing shoe. Come on. 40. 30 then. £30 on the dealing shoe. Come on. 20. 20 on the dealing shoe. Come on. £20 on the dealing shoe. -There you are. Look at this. 30. 32. 34. 36. 38. 40. Advance on 40. Thank you. 45. £45 here. Advance on 45 now. We finish on £45. All out on 45. -Why is there a big cat on your lap? Hey, you brought me luck. Every cat likes a winner and Margie, remember, has a comfortable lead. It wasn't the cat that bought it, was it? Can Margie do as well with a biscuit tin? An Edwardian novelty biscuit tin in the shape of a book. -Isn't that lovely? Gourmets Delight. What shall we bid for this one then? £20? 20 on the biscuit tin. £20. £15. Ten. £10. Advance on ten. -Hang on, Margie, they need to work on this. Advance on £10. Advance on ten. They are collectable. £10. Advance on ten. The biscuit tin. Come on. Advance on ten. Margie's first loss for some time. Now for Charlie's big gamble, the French cabinet. -I was foolish to spend 100 quid on something like that. Quite attractive You can have that in any room in your house, I think. So let's go with that one. £100. £100 on the cabinet. 100. £80. 80 on the cabinet. £80. Thank you. 80 bid. Advance on 80. -Advance on 80. Thank you. 85. -90. 95. 100. £100 here. Advance on 100. More now. Advance on 100. 120. 130. 140. 140 to my right. Advance on 140. Finished at 140. All out at 140. He got away with that, I'd say. -My heart's going like the clappers. What about the frame he bought at the same shop? Come on, Mrs Adam, I want to see your hand shooting up this time. Wee romantic that you are. Let's go. £30. £30. 30. Come on. 20, then. 20 to start it. 20. 22. 24. 26. 28. 30. 32. 34. 38 with you. £40. 40. Advance on 40. Come on. Advance on £40 now. Romeo and Juliet and all that. 45. -She's bunged you a fiver. -Advance on £45. Are we finished at 45? More blessed relief for Charlie. It's not what you call comfortable, is it? Time for the clock that Margie agonised over for so long. -I declare myself worried about your clock. "What has the old bag done?" Let's go for £50, please. 50 on the clock. It's a nice one. 50. 40 then. Come on. £40 on the slate clock. 40. It's a nice size. -£30 on the slate clock. 30. 30 bid. 32. 34. £40. 45? £45? Advance on 45 now. I just had a bad buying day, didn't I? Did you have a migraine or something? Something tells me this won't go well. A Carlton Rouge Royale two-branch candleholder and ashtray. £10. Ten. -We'll take it to the next auction! -Need a free pair of tights with these. -Advance on five. Advance on £5. -It is unsaleable, this stuff. That confirms Margie's luck's just run out. The candlesticks were all right, the candelabra thing. Calling it a candelabra is pushing it a bit! She was a big fan of Charlie's bargain jar. Thank you, Gavin. £20 bid. The man's on 20. £30 here. Advance on 30 now. Advance on £30. That's OK. Nice little profit. Charlie's quietly creeping ahead here. -I'm so unused to winning anything in my life. This has come as a bit of a golden day really. Can Margie's bagatelle get her back in the game? She needs snookers. -This is a definite profit. -There's no doubt about this. -She's obviously got faith in this. She's interested. £80. Come on. 80. 60 then. £60 on the bagatelle. 60. £50. 50. Come on. £50. My goodness. You're not in the mood tonight, are you? -Shall I keep going for you? £50. 40 then. £40. £40. Thank you. 40 bid. Advance on 40. Advance on £40. Advance on 40. We finish on £40. Stuart. -Oh, crumbs, it's not been your best, has it? I just hope that whoever bought it knows the rules. -I don't know whether to laugh or cry. -If I were you, I'd cry. Will Charlie's carriage clock hand him yet more profits, I wonder? -This is it. The final countdown. £100. £100 on the carriage clock. -At least you're asking for 100. £80 for the carriage clock. £80. How often do we get them in this condition? £80. 50. £50 for the carriage clock. 50. Thank you. Advance on 50 now. 60. 65. 70. 75. 80. £80. Advance on 80. Advance an £80. At £80 now. Did you see him? "God, that was cheap, wasn't it?" Not bad but it hardly justified the gamble. I'm not spending more than five quid on anything else ever again now. Come on. mean that Charlie is the winner today. Margie started out with £315.10. leaving her about where she started with £201. leaving him with £309.42 to spend next time. Well done, my boy. -Well done. The boy did well. -Thank you, darling. Here we go. Next on Antiques Road Trip, Charlie tees off. Will you get back in the car, please? And Margie's told to clear off.